Tired of your dentures slipping out of your mouth? Want to be able to chew better and have more function in your bite? We provide solutions with dentures supported by implants. We Offer Innovative Implant-Supported Overdentures to Complete Your Smile! At All-in-One Dental Innovations, Dr. James Huang has given implant-supported overdenture a new name. Our innovative implant-supported overdenture is designed to help those with missing or broken teeth complete their smile and feel beautiful again. Dr. Huang is highly skilled and delivers a high level of patient care that you deserve when you undergo dental implant treatment for a more comfortable, permanent smile. 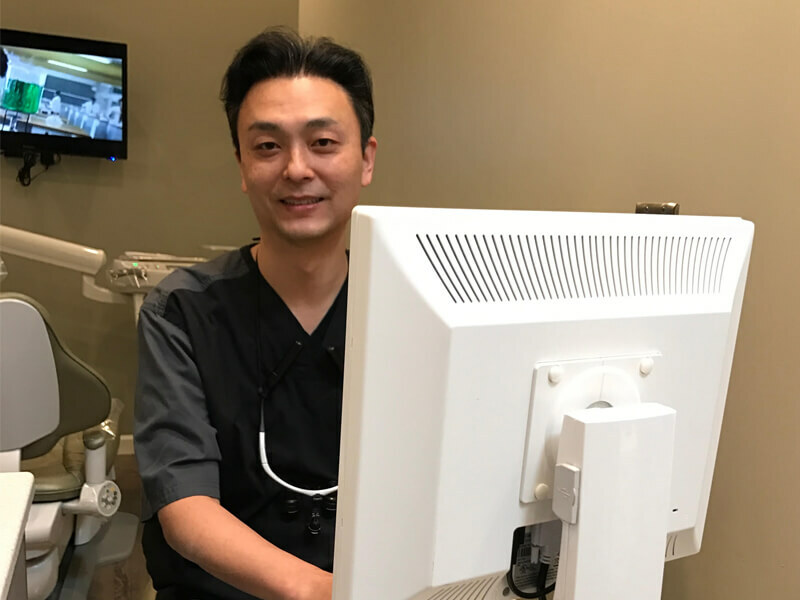 Although cosmetic dentistry or oral surgery may seem scary at first, Dr. Huang and the team at All-in-One Dental Innovations are here to help. Is an Implant-Supported Denture Right for Your Situation? Dental implants are a popular treatment for those patients that want to replace missing teeth and restore your natural smile. While dental implants use small titanium anchors permanently placed onto your lower and/or upper jaw bone, and implant therapy is typically prescribed for those people with multiple missing teeth, or those missing all of their teeth. For those that need partial or complete dentures, implant-supported overdentures are the best option. Overdentures are replacement teeth that are retained by dental implants. They were originally developed to help partial and fully edentulous patients to help them restore their confidence and quality of life. When dental implants integrate with the patient’s bone, the overdenture and implants will act like your natural teeth. There are three types of overdenture treatments available. The first being implant-retained, sum supported overdenture treatment rests directly on your gums and is retained by implants placed into the upper and/or lower jaw. It is removable, secured through retentive attachments incorporated into the denture. This type of overdenture is the “minimum” care for fully edentulous patients. Implant-supported overdenture includes bar-retained and fixed options, with the fixed options being the most expensive of the two. 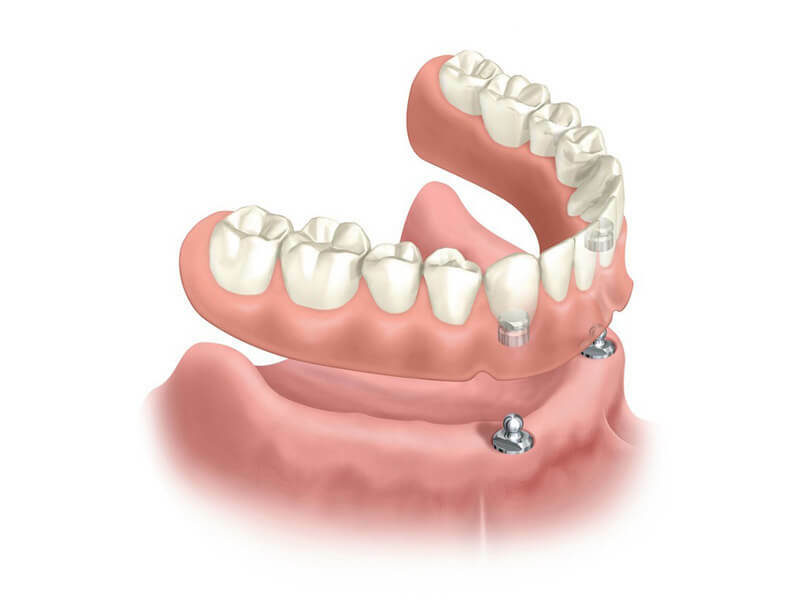 The overdenture and bar are a one-piece framework secured with screws to implants placed into the upper and/or lower jaw, and only a dentist can remove it. 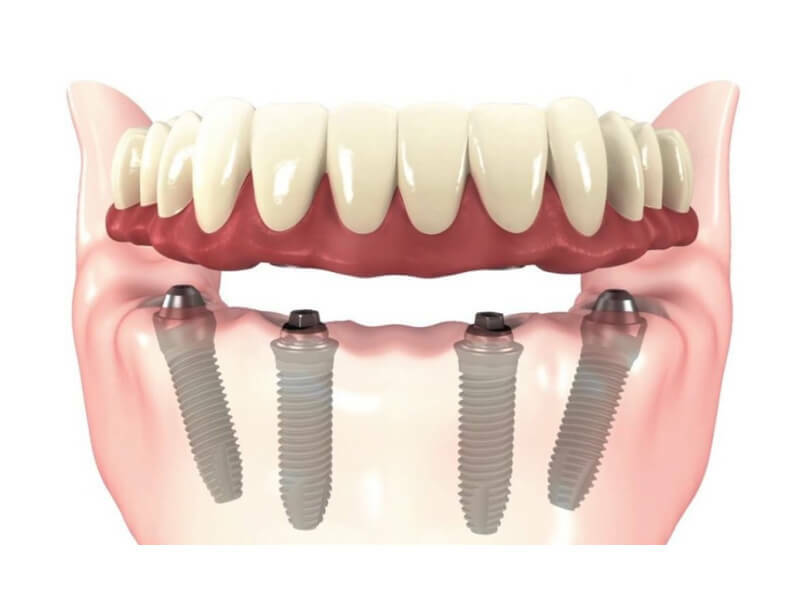 Bar-retained overdenture treatments, however, engage retentive attachments on a metal bar that connects to the patient’s implants, and this bar is placed into the jaw. This overdenture is removable. The reasons behind a patient’s lost teeth never matter at All-in-1 Dental. Dr. Huang and his experienced team are not here to judge, only to make sure you receive the treatments that are best for your situation. When you’ve scheduled your appointment, you’ll be able to discuss your situation and help us restore your smile and your self-confidence. What Are The Benefits With Stabilizing Your Dentures With Implants? Missing Teeth Getting You Down? Especially when missing teeth are located at the front, the reasons fall by the wayside and you simply feel the missing pieces. Even those with natural confidence will find that they want to fill in these gaps. They want to better their smile. When you want to fill the gaps caused by missing teeth, you can consider dentures, bridges, or dental implants to complete your smile. What Are the Alternatives to an Implant-Supported Denture? Dentures are a more affordable option to implant-supported overdenture treatments. However, they are not as natural-looking and they are only held in by dental adhesive. They do not always make eating and speaking easier for patients as there is a chance for them to slip around and even fall out – this is just as embarrassing as missing teeth for some. Bridgework is more permanent and doesn’t slip around, but it does not allow for a more natural look. If you aren’t concerned about a natural-looking smile and only want to make sure that the adjoining teeth are protected and do not grow together or cause other problems. Implant-supported overdentures, however, and dental implant treatments are preferable to these alternatives because they are more permanent, natural, and you can get the right amount of implants for your individual situation. Still, if you are considering these alternatives, speak to Dr. Huang during your initial consultation and he can help you find out which option is best for you. When you are looking to complete your smile and feel confident again, your best option is a dental implant treatment customized for you by Dr. James Huang. Dental implants and most implant treatments may last up to 25 years, which is preferable to other dental replacement alternatives for many patients. With the help of Dr. Huang, you will be able to take care of them easily and ensure they last as long as they should. When you schedule your initial consultation, Dr. Huang will explain the procedure, risks, and costs with you. Dedicated to open and honest communication, there is no need to be concerned about surprises regarding your implant-supported overdenture treatment. Although overdenture treatments cost more than traditional dentures, they are less expensive than individual dental implants. For many patients, it is well worth the cost to have a more lasting option to traditional dentures. Our staff is highly skilled, so you can be sure that you are in the best hands to create a newer, more confident smile. Typically, healing time will vary for each patient. Although we understand the uniqueness of each situation, it generally takes 4 to 6 months for the jawbone to fuse completely with the implant. During that time, you will be fitted for a temporary crown to ensure a beautiful smile during the healing process. After healing is complete, you will be fitted for a permanent crown that will resemble a natural tooth – and bam – less worry for you. Remember, if you run into any issues with your new implant-supported overdenture, be sure to call us – we are 100% dedicated to bringing your confidence back and maintaining your oral health. Contact Us Today To Learn More About Implant-Supported Dentures! 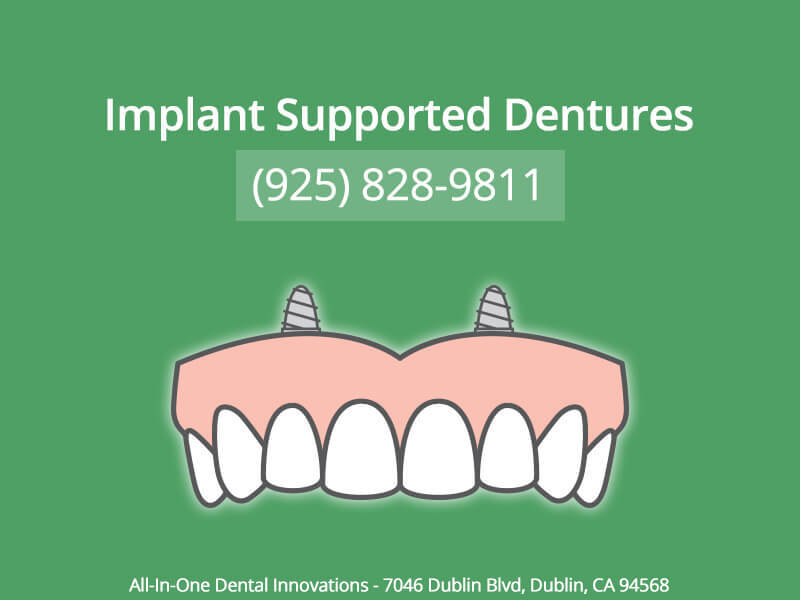 At All-in-One Dental, we are excited to offer the best implant-supported overdenture in Dublin, California. Our highly skilled Dr. James Huang and his team delight in the ability to give patients their confidence back, their ability to smile and feel happier overall. Because dental implants are a more permanent and natural solution, you’ll find that our implant-supported overdenture treatments are the best solution for your missing teeth. If you are interested in a more natural and permanent solution for a new smile, do not hesitate to call All-in-One Dental to address your questions and concerns. Call us today at (925) 828-9811 or check out our website to book your appointment online. Dr. James Huang and his team are prepared to exceed your expectations and give you 100% of your confidence back.